Feed additives are non-nutritive feed ingredients that are not required by swine. In the absence of feed additives in the diet, no deficiency symptoms will result. They may, however, enhance production and profitability under the right circumstances. Feed additives are regulated in the U. S. by the Food and Drug Administration (FDA), and it is very important that the regulations be followed. The official regulations can be found in the Feed Additive Compendium  for antibiotics and the AAFCO (Association of American Feed Control Officials)  guide which sets guidelines and definitions for animal feed use of additives that are generally regarded as safe (GRAS). For most users, the appropriate usage and withdrawal information is provided by the supplier and is on the feed tag. There are many classes of feed additives, including: antibiotics and antimicrobials, anthelmintics (de-wormers), direct-fed microbials (probiotics), prebiotics, pellet binders, flavors, enzymes, growth and feed efficiency enhancers, supplemental nutrients, mold inhibitors and preservatives, and a beta-adrenergic agonist (ractopamine). Describe the general use and potential effects of many feed additives for swine. Antibiotics have been used in animal agriculture for over 50 years. Their use has been primarily to prevent colonization by pathogenic microorganisms in the intestine and to aid in control of respiratory and reproductive bacterial diseases. Antimicrobials are used in animal production both therapeutically (to cure or prevent certain diseases) and subtherapeutically to increase productivity (improved rate of gain and feed efficiency). Subtherapeutic or “growth promoting” levels of antibiotics improve average daily gain and feed efficiency of pigs under most conditions . These responses to growth-promoting concentrations of antibiotics have typically been greater in the young, nursery age pig, than the finishing pig (Table 1). They can only be used at approved levels and in approved combinations outlined by the FDA and published in the Feed Additive Compendium . There are two main concerns with feeding antibiotics to livestock: 1) Any antibiotic residue remaining in the animals’ tissues because of inadequate withdrawal could enter and contaminate the human food supply; 2) Microorganisms sometimes develop resistance to antibiotics, making the antibiotic less effective in the swine operation. Producers should utilize antimicrobial products under veterinarian consultation and according to regulations. For more information on specific antibiotics, their effectiveness and appropriate feeding concentrations refer to the Feed Additive Compendium and for general feed withdrawal timelines prior to slaughter see Table 2. To ensure that pork producers are handling antibiotics correctly the National Pork Board has established a program on residue avoidance. The Pork Quality Assurance Plus program effectively acquaints producers with the different drugs, their proper use and withdrawal times. It is advisable to obtain professional veterinary assistance when developing an antibiotic use program for your farm. Swine are susceptible to infection by numerous species of internal and external parasites. The life cycle of parasites can vary widely and involve various target organs and tissues depending on the parasite. Feed has been used to provide effective administration for many anthelmintic products for many years. In most applications the anthelmintic is used for a prescribed interval and dosage rate. This regimen purges the adult parasites and may kill developing larvae depending on the product used. Once the anthelmintic is withdrawn the animal becomes susceptible to reinfection upon exposure to a contaminated environment or animals. The availability of feed-grade mange and lice control products has enhanced the pork producers’ ability to control both internal and external parasites. A wide range of products are available and have variable withdrawal times prior to slaughter (Table 2). It is advisable to obtain professional veterinary assistance when formulating a parasite control or eradication program because the anthelmintic products are parasite specific in their control . Copper Sulfate (CuSO4) has been used at elevated growth-promoting levels in nursery and grower pig diets between 125 to 250 ppm (copper requirement is 3 – 6 ppm) for an antibiotic-like growth effect for decades in swine production . The average response to feeding 200-250 ppm copper from copper sulfate is improved nursery pig ADG (11.9%) and feed efficiency (4.5%) and 6.9% ADG and 3.6% feed efficiency improvements in the grower pig, with the finishing pig response being one-half of the grower pig response . The 250 ppm level corresponds to 0.1% copper sulfate, or 2 pounds per ton inclusion level. Generally levels between 125-250 ppm copper are most effective, with the 100-125 ppm level resulting in 75-80% of the response of the 250 ppm level . Tribasic copper chloride fed at 100 or 200 ppm has been reported to provide a similar improvement in nursery pigs as 100 or 200 ppm copper sulfate . Lower levels (50-100 ppm) from copper sulfate or copper chloride have improved early grower pig growth and feed efficiency and overall grow-finish pig growth and feed efficiency when pig performance was low . The use of Copper-lysine complexes appears to have the same effect as copper sulfate in improving nursery pig growth performance [7,8]. Levels above 250 ppm (500+ ppm) border on toxicity, producing negative effects on pig performance . Zinc oxide (ZnO) is commonly being added to nursery diets at le aFeed Additive Compendium, 2008  bWithdrawal times may increase when fed at therapeutic levels or in approved combinations. vels to provide between 1500 and 3000 ppm zinc (the zinc requirement is 100-165 ppm). Research has reported improvements in nursery pig growth rate and reductions in diarrhea when these levels of zinc are fed [9,10,11]. However, if 3000 ppm zinc is fed too long (more than 5 weeks), toxicity symptoms may result along with other mineral deficiencies . Tetrabasic zinc chloride has been reported to be effective at improving pig nursery pig performance at 1500 ppm zinc similar to the response at 3000 ppm zinc from zinc oxide . Zinc chloride may be an option to provide a similar zinc effect in nursery pig diets at lower inclusion levels. The feeding of organic zinc sources has not yielded a consistent improvement in nursery pig growth compared to zinc oxide . In a small study, a Zn-polysaccharide complex fed at 300-450 ppm has produced a similar growth effect compared to feeding inorganic zinc oxide at 2,000, but requires further evaluation . However, a large study evaluating zinc –methionine found that zinc-methionine improved nursery pig growth above the negative control but not to the level of 2,500 ppm zinc oxide and when they tested 5 other organic zinc sources, none provide the same improvement in growth as the 2,000 ppm zinc from zinc oxide  . It has also been reported that when pigs are fed an organic zinc source they will excrete significantly less zinc than pigs fed 2,000 ppm ZnO, while maintaining similar pig growth performance [14,15]. Organic copper sources may also be as effective as copper sulfate at lower inclusion concentrations, 50-75 ppm, with a significant reduction in copper excretion . Field observations that the manure from pigs fed high levels of zinc is more caustic to flooring, plus creating extremely high zinc levels in the manure may play a part in management decisions about durations and level of zinc in nursery diets [16,17]. Table 2. Withdrawal time prior to slaughter for antibacterials and anthelmitics in swine feedsa. Chromium is sometimes considered an essential nutrient, but the requirement is likely so low that it will never be deficient, and no deficiency disease has ever been described. Chromium participates in carbohydrate-metabolism by improving glucose utilization through potentiating the effects of insulin binding to cell receptors. Chromium must be added to the diet in a chelated form to be utilized by the pig . Chromium supplementation (200 ppb) has been proposed to enhance leanness in grow-finish pigs by decreasing backfat and increasing loin eye area (LEA), however, the data is not consistent. When averaged across 10 experiments, LEA increased 0.4 inches, backfat declined 0.1 inches, and percent lean increased 1.9% . Corresponding with these slight changes in lean content of grow-finish pigs was a slight improvement in nitrogen digestibility and retention and improved feed efficiency when pigs are fed near their amino acid requirements . When pigs are fed above their nutrient requirements the feed efficiency response to supplemental chromium was very small. Therefore, routine inclusion of chromium in growfinish diets is situation dependent and may not be profitable in all operations . Several studies indicate chromium picolinate may positively affect the breeding herd by increasing pigs born alive 0.5 to 1 pig after feeding chromium for two parities. In addition, increased farrowing rate has been observed when chromium was fed in finishing and/or gestation and lactation phases [18,19]. Based on these findings, chromium is included in several sow add packs at the maximum legal addition of 200 ppb chromium. Carnitine is a lysine metabolite that functions within the cell to transport lipids into the mitochondria for use as energy . Young neonatal mammals do not have the ability to synthesize carnitine from lysine and that has been the driving force for interest in using carnitine in nursery pig diets. For swine, carnitine has shown some promise in reducing backfat in finishing pigs when fed at 50 ppm [21, 22]. Carnitine may also increase birth and weaning weights of piglets when fed at 50 ppm to sows and influence muscle fiber development in fetuses of gestating sows . Because of the effects of L-carnitine on sow performance, it is added to several commercial sow vitamin premixes. Additionally, there may be some additive effects of adding chromium and carnitine to sow diets because carnitine works through fat metabolism and chromium works through glucose metabolism and potentially creating some synergistic effects between the two feed additives . Betaine has been proposed to increase leanness and enhance feed efficiency in finishing pigs, but research data has shown mixed results to support this claim . Betaine is a choline metabolite that is involved in osmotic regulation, methionine metabolism, and serves as a methyl donor. The impact of betaine in pigs is dependent on the sulfur amino acid and energy concentrations in the diet with the response to betaine being greater in diets low in energy and marginally deficient in sulfur amino acids (methionine, cystine). Betaine’s role as a methyl donor could have a sparing effect of methionine when it fills this role in diets that are marginally deficient in methionine . Common organic acids used in swine diets are: formic, acetic, propionic, butyric, citric, lactic acids, and their salts (Table 3). Organic acids are fed as both individual acids and blends of several acids. Acids have been used in swine diets to prevent mold growth in feed, but may also have antimicrobial and performance benefits. Adding organic acids to nursery diets tends to improve ADG and feed efficiency during the nursery period . The improved performance is usually observed when less complex diets with lower amounts of milk ingredients are being fed. Organic acids may also be of benefit when there is a problem with E. coli in the nursery . Another use for acids in swine nutrition is when feeding high moisture grain, where the acid acts as a mold inhibitor, increasing the storage life of the grain and diets. However, pig studies incorporating inorganic acids (hydrochloric and phosphoric acids) have been more variable on their effects on pig growth performance and GI pH. There is currently some interest in utilizing blends of both organic and inorganic acids in nursery pig diets, hoping to provide multiple potential modes of action in one product . It is important to remember that these are acids, and they may be caustic to your feeding equipment. Table 3. Performance response of weaned piglets to dietary formic, fumaric, and citric acid and potassium diformate supplementation (≤ 25g/kg feed) based on meta-analysis of published data. Pigs express definite preferences for certain substances and tastes. Feed flavors are added to enhance the smell and taste of feed in order to stimulate feed intake, especially in post-weaning diets . Most flavoring additives are based on providing a sweet, milky, vanilla, or fruity flavor and smell to the diet. However, if they are not given a choice, pigs will usually eat the same amount of feed as without flavoring agents, if the feeds are of good quality. Flavors have been used in specialty feeds, for example to simulate milk in milk replacers or milk products in nursery pig diets . Some chocolate by-products are being used as alternatives to lactose in nursery diets, but they may also serve as a sweet flavoring additive too. Certain extracts from the desert cactus plant, Yucca schidigera, have increased feed efficiency in some research studies with pigs . When it is used in swine manure pits or fed to pigs it reduces ammonia production and has been used to aid in odor control . The active ammonia reducing compound in yucca extract has not been identified, but is thought to work as a urease inhibitor to decrease ammonia levels . The Yucca schidigera whole plant extract has also been reported to reduce still-births in sows when fed prior to farrowing  and may serve as a production aid if still-births are an issue in your swine operation. The use of probiotics or direct-fed microbials (DFM) to enhance intestinal health has been proposed for many years. In fact, probiotics have been used for as long as people have eaten fermented foods. Probiotics are traditionally defined as viable microorganisms that have a beneficial effect in the prevention and treatment of specific pathologic conditions when ingested . Pigs have a diverse gut microflora, containing over 400 bacterial species; with bacterial cells outnumbering host cells by a factor of 10 . One strategy for preventing colonization of the GIT by pathogenic bacteria is to include DFM in the diets of pigs. Direct fed microbials are defined by the FDA as “a source of live (viable), naturally occurring microorganisms.” The use of “naturally occurring microorganisms” in the above definition negates the use of genetically modified microorganisms as DFM. Furthermore, DFM cannot be bacterial strains selected to produce antibiotics . As of 2010 there were 46 microorganisms approved for use in animal feeds (Table 4) . Table 4. List of microorganisms approved for use in United States animal feeds. In general these microorganisms can be grouped into three categories: 1) lactic acid producing bacteria (i.e. enterococci, streptococci, and lactobacillus), 2) bacteria belonging to the bacillus genus, which are spore formers, and 3) saccharomyces yeasts. In general it is recommended that the microorganisms be included in the diet at a level of 104 to 105 colony forming units (CFU’s) per lb of feed. There is concern with regards to the viability of these microorganisms post-feed processing, especially following pelleting. Certainly, the spore forming bacteria are capable of withstanding high temperatures of pelleting, but many of the other microorganisms may be more heat sensitive. In a review of 44 published experiments by Simon et al. (2003) , a numerical improvement in ADG was observed in over 70% of the experiments reported (Figure 1). However, only 6.8% of the experiments reported improvements in ADG that were statistically significant. Similar results were reported for ADFI. Simon et al. (2003) hypothesized that one reason for the lack of statistical improvements in performance parameters may be the variability in individual pig response to DFM . The inconsistency in responses to probiotics reported by early research and more recent research may also be partially explained by the use of different DFM strains. Earlier studies were dominated by the use of mixtures of microorganism with lactobacillus as the primary strain compared to later studies where mainly bacillus and enterococcus strains were used. Recently, Risley and Lopez (2004) [cited by 24] reviewed 6 experiments in which improvements in ADG ranging from approximately 4 to 7% were observed in all 6 experiments (Figure 1), although, none of the improvements proved to be statistically significant. 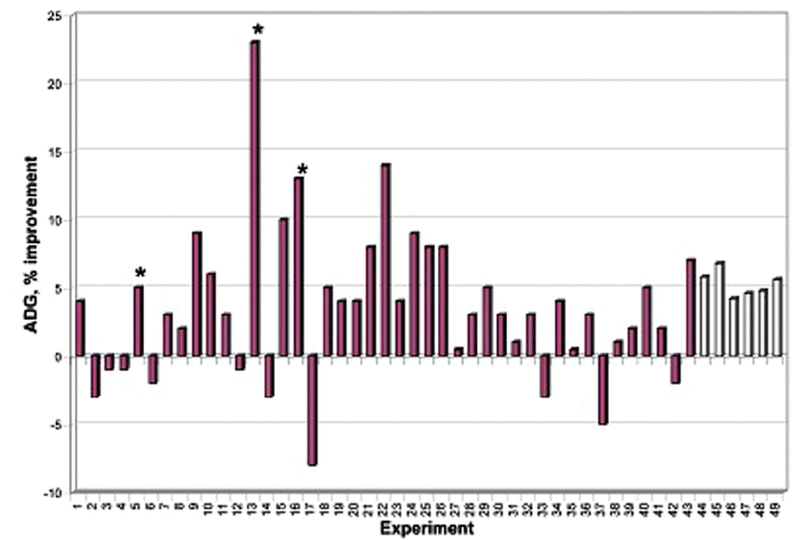 A review of ten experiments where the incidences of diarrhea were measured, significant reductions in diarrhea were observed in 8 of 10 experiments . Direct-fed microbials function to indirectly affect all intestinal systems, intestinal microbial populations, epithelial lining, gut associated lymphoid tissue and neuro-endocrine systems alike. Due to the complexity of the intestine, individual variations of animals to direct-fed microbials inclusion may be the rule and not the exception. The term prebiotic was first coined by Gibson and Roberfroid (1995)  and given the formal definition of “a non-digestible food ingredient that beneficially affects the host by, selectively stimulating the growth and/or activity of one or a limited number of bacteria in the colon that can improve the health of the host”. This translates to the addition of a particular feed substrate that will foster growth of a specific bacteria or group of bacteria that are advantageous to the health and normally functioning of the host digestive system. Non-digestible carbohydrates include non-digestible oligosaccharides, non-starch polysaccharides and resistant starches. All of these non-digestible carbohydrates are resistant to mammalian enzyme digestion, however, are hydrolyzed by bacteria in the small intestine, cecum and large intestine. An advantage of prebiotics over DFM is that prebiotics are not affect by heat processing. The chemical structure of fructo-oligosaccharide (FOS) consists of short chain polymers of β1-2 linked fructose units and they are not hydrolyzed by mammalian enzymes. Fructo-oligosaccharide are produced commercially either by hydrolysis of inulin or by enzymatic synthesis from sucrose or lactose. Specific non-digestible oligosaccharides promote the proliferation of certain strains of bacteria. The purpose of supplementing FOS in the diet of weanling pigs is to maintain a healthy microbial balance by selectively promoting the proliferation of beneficial bacteria such as bifidobacteria and lactobacilli. The predominant species of bifidobacteria in pigs is Bifidobacterium pseudolongum-Type A . Bifidobacteria are saccharolytic bacteria which means that their energy substrate of choice are sugars such as glucose, galactose, and fructose. Through the specific selection for beneficial bifidobacteria, FOS may have a role to play in combating post-weaning diarrhea caused most frequently by enterotoxigenic Escherichia coli (ETEC) strains. Bifidobacteria have antibacterial effects because they can suppress the growth of potentially pathogenic E. coli bacteria. A review of the literature however suggests that the effects of dietary FOS on growth performance of weanling pigs is often inconsistent and conflicting and may have a greater potential in operations with a history of E. coli challenges . Mannan-oligosaccharides (MOS) are a glucomannoprotein complex derived from the yeast cell wall of Saccharomyces cerevisiae. This oligosaccharide carries out two distinct functions in the gastrointestinal tract, adsorption of enteric pathogens and immunomodulation. If one were to adhere rigidly to the definition of a prebiotic, mannan-oligosaccharides would not qualify as a true prebiotic. Their primary mode of action is not to enhance the growth of a specific strain of bacteria. Under normal conditions pathogenic bacteria in the intestine will bind to mannose-containing cells and colonize causing disease . Mannanoligosaccharides function by providing a mannose-rich source for bacterial attachment and bacteria that would otherwise attach to the intestine are adsorbed to the mannose compound and then excreted. Like all other oligosaccharides, mammalian enzymes fail to degrade mannan-oligosaccharides and are passed from the small intestine with the pathogenic bacteria attached. Miguel et al. (2003) carried out a metaanalysis of the performance response of weanling pigs to mannan-oligosaccharides in which they reported an increase in ADG (4.15%), ADFI (2.08%), and a 2.34% improvement in feed efficiency across experiments . Sucrose thermal oligosaccharide caramel (STOC) is produced by thermal treatment of anhydrous acidified sucrose yielding a complex mixture containing fructose-rich oligosaccharides and di-fructose di-anhydrides . Bifidobacteria were selectively enriched by feeding a fructo-oligosaccharide , however STOC failed to elicit positive growth results in nursery pigs . Lactulose is a semi-synthetic disaccharide made from lactose by a chemical reaction. Lactulose is not present in nature and does not occur naturally . Lactulose has been shown to increase ADG in weanling pigs fed lactulose 10 days prior to and 10 days following weaning . Lactulose fed in the diet to weanling pigs was found to decrease the population of gram-negative anaerobes in chyme and feces and was also shown to decrease the concentration of VFA in pre-caecal chyme thereby demonstrating the potential for a positive effect on microbial populations . Lactulose addition to sow diets has resulted in significant reductions in aerobic bacterial counts and Clostridium perfringens counts in the offspring . Among the various oligosaccharides tested for potential prebiotic application, galactooligosaccharides (GOS) have attracted interest because these are the compounds in human milk that have been associated with the improved colonic health of breast-fed infants . The addition of a novel GOS mixture to the diet of weanling pigs increased the density of bifidobacteria, increased the acetate concentration and decreased the digesta pH compared to the control diet [44,45]. The addition of dietary fiber from many readily available feedstuffs may represent the easiest method of adding fermentable substrate to pig diets to alter the pig’s microbial gut population and gut health. To date most research has evaluated soybean hulls, beat pulp, wheat bran, oat bran, and citrus pulp in pig diets. While most of the research has focused on utilization of these low cost feedstuffs on pig performance in grow-finish pigs, only a limited amount of research has focused on the impact fiber and its various fractions have on microbial populations and gut health. At low dietary inclusions (1-5%), fibrous feedstuffs may provide beneficial effects on gut health and stimulate beneficial microbial populations in the gut while improving animal growth [46,47]. Laxatives can be of benefit during gestation and early lactation to improve bowel movements and feed intake if constipation is a problem in the sow herd. However, it should be used on a farm by farm basis for specific problems. First determine that the sows are receiving adequate water and flow rate before adding laxatives. Also, sows that are pen gestated tend to have fewer problems with constipation than sows in stalls because of the added exercise. To aid in constipation control, mineral laxatives or simply adding fiber to the diets can be used. The addition of fibrous feedstuffs (soybean hulls, wheat midds, wheat bran, beet pulp, alfalfa meal) during gestation is preferred due to their low cost and low dietary energy density can aid in maintaining sow body condition during gestation. A mineral laxative (magnesium-, potassium-, or sodium-sulfates) during lactation would be preferred, because of the low inclusion levels and needing to maximize energy intake during lactation [16,17]. Increasing the dietary levels of omega 3 fatty acids eicosapentaenoic (EPA, C20:5) and docosahexaenoic (DHA,C22:6) has received increased attention in recent years, primarily for sows. The omega 3 fatty acids are thought to have health benefits in human diets. However, in swine diets the focus has been on improving sow reproductive performance and improving piglet viability. Sources of omega 3 fatty acids typically include flax seed or oil and fish oils. The supplementation of sow diets with omega 3 oils has provided some positive, yet inconsistent results to increase born alive, number weaned, and to reduce rebreeding days. There appears to be some promise with feeding omega 3 fatty acids, however, dose, duration, specific fatty acid(s) responsible for the potential effects are still not clearly defined . Ractopamine HCl (Paylean®), a type of beta-adrenergic agonist, can substantially improve the rate and efficiency of lean growth of swine. The growth response to this feed additive is immediate and then declines over time. Ractopamine HCl increases fat-free lean accretion by approximately 25-35% over a 28 day feeding period prior to market. However, this response is dependent on concentration and duration of use prior to slaughter. Because of the increased protein deposition, dietary amino acids, phosphorus, vitamin and trace mineral concentrations need to be increased to support the improvement in lean gain. An increase in SID lysine of 5 to 6 g per day when high lean gain pigs are fed ractopamine HCl is required. The dietary lysine concentration needs to be increased by approximately 0.20 to 0.30 percentage units (while maintaining the other amino acids in a proper ratio to lysine) relative to diets without ractopamine HCl to meet these amino acid needs and the dietary crude protein must be at least 16% CP by law. For more detailed information on ractopamine HCl see Factsheet 07-03-06, Feed additives for swine – Paylean. Several studies have demonstrated the ability to create CLA-enriched pork through feeding 0.6% CLA for 4 to 8 weeks prior to slaughter. In addition to the marketing advantages of CLA-enriched or “heart-healthy” pork, feeding CLA-supplemented diets may provide a means by which backfat in average lean gain genetics can be decreased and percent lean can be increased with improved feed efficiency and carcass fat quality. CLA also improves fat firmness, thus improving fat quality of swine. As pork-processing plants become increasingly mechanized, CLA may provide a nutritional tool to counteract carcass fat and belly firmness problems from feeding dietary unsaturated fats and may enhance the overall value of extremely lean carcasses. For more detailed information on CLA see PIG Factsheet 07-03-05 (Feed additives for swine – conjugated linoleic acid). Botanicals are compounds derived from roots, leaves, bark, flowers or other parts of plants. Many of these herbs have been used for treatment and prevention of disease in humans and animals for centuries in many parts of the world. Some of these “natural remedies” contain compounds that may have antiviral or antibacterial effects on pathogens, antioxidant properties, enhanced immune response, and anti-diarrheal effects on pigs. Herbs may also improve feed intake by enhancing diet palatability. Oregano, garlic, mixtures of essential oils, spices and other herbs are just some of the botanicals being evaluated for use in swine diets. Research supporting their effectiveness in swine diets is very limited and does not yet lend itself to support general recommendations for adding these products. Additionally, there are challenges with standardization of assaying the active compounds in these herbal supplements to determine appropriate inclusion rates in swine diets [4,16,17]. Feed additives are nonnutritive feed ingredients that are not required by swine. However, they may enhance production and profitability under the right circumstances. Many additives have their proper production phase, usage rate, and duration of use to be effective tools to enhance the production and profitability of the swine operation. It is advisable to obtain professional assistance from your nutritionist or veterinarian when developing use programs for your farm for these many feed additives. 1. Feed Additive Compendium. 2008. Miller Publishing Company, Minnetonka, MN. 2. AAFCO. 2010. 2010 Official Publication. Association of American Feed Control Officials Incorpoated. 3. Cromwell, G.L. 2001. Antimicrobial and promicrobial agents. In: Swine Nutition, 2nd Edition. Ed. A.J. Lewis and L.L. Southern. CRC Press. pp 401-426. 4. McKean, J. Feed additives for swine. National Pork Board. Published in the Pork Industry Handbook as PIH 07-03-01, Purdue University, West Lafayette, IN. 5. Cromwell, G.L. M.D. Lindemann, H.J. Monegue, D.D. Hall, and D.E. Orr, Jr. 1998. Tribasic copper chloride and copper sulfate as copper sources for weanling pigs. J. Anim. Sci. 76:118. 6. Hastad, C.W., S.S. Dritz, J.L. Nelssen, M.D. Tokach, and R.D. Goodband. 2001. Evaluation of different copper sources as a growth promoter in swine finishing diets. Kansas State University, Agricultural Experiment Station and Cooperative Extension Service, Manhattan, KS. Swine Day. pp 111-117. 7. Apgar, G.A., E.T. Kornegay, M.D. Lindemann, and D.R. Notter. 1995. Evaluation of copper sulfate and copper lysine complexes as growth promoiters for weanling swine. J. Anim. Sci. 73:2640. 8. Coffey, R.D., G.L. Cromwell, and H.J. Monegue. 1994. Efficacy of a copper-lysine complex as a growth promotant for weanling pigs. J. Anim. Sci. 72:2880. 9. Smith, J.W. II, M.D. Tokach, R.D. Goodband, J.L. Nelssen, and B.T. Richert. 1997. Effects of the interrelationship between zinc oxide and copper sulfate on growth performance of early weaned pigs. J. Anim. Sci. 75:1861-1866. 10. Carlson, M.S., G.M. Hill, and J.E. Link. 1999. Early- and traditionally weaned nursery pigs benefit from phase-feeding pharmacological concentrations of zinc oxide: effect on metallothionein and mineral concentrations. J. Anim. Sci. 77:1199. 11. Hill, G.M., G.L. Cromwell, T.D. Crenshaw, R. Dove, R.C. Ewan, D. A. Knabe, A.J. Lewis, G.W. Libal, D.C. Mahan, G.C. Shurson, L.L. Southern, and T.L. Veum. 2000. Growth promotion effects of high dietary concentrations of zinc and copper in weanling pigs. J. Anim. Sci. 78:1010. 12. Mavromichalis, I., D.M. Webel, E.N. Parr, and D.H. Baker. 2001. Growth-promoting efficacy of pharmacological doses of tetrabasic zinc chloride in diets for nursery pigs. Can. J. Anim. Sci. 81:387-391. 13. Hollis, G. R., Carter, S. D., Cline, T. R., Crenshaw, T. D., Cromwell, G. L., Hill, G. M., Kim, S. W., Lewis, A. J., Mahan, D. C., Miller, P. S., Stein, H. H., Veum, T. L. 2005. Effects of replacing pharmacological levels of dietary zinc oxide with lower dietary levels of various organic zinc sources for weanling pigs. J. Anim. Sci. 83:2123-2129. 14. Buff, C. E.; Bollinger, D. W.; Ellersieck, M. R.; Brommelsiek, W. A.; Veum, T. L. 2005. Comparison of growth performance and zinc absorption, retention, and excretion in weanling pigs fed diets supplemented with zinc-polysaccharide or zinc oxide. J. Anim. Sci. 83:2380-2386. 15. Hellman, H. and M. Carlson. 2003. Feeding organic and inorganic sources of trace minerals for swine production. University of Missouri Extension publication G2323. 16. Tri-State Swine Nutrition Guide. 1998. Feed additives. The Ohio State University. pp74-79. 17. Kansas State Swine Nutrition Guide. 2007. General Nutrition Principles for Swine, MF-2298. Kansas State University. 18. Lindemann, M.D. 1999. Chromium and swine nutrition. J. Trace Elements Exp. Med. 12:149-161. 19. DeRouchey, J., M. Tokach, S. Dritz, B. Goodband, J. Nelssen. 2005. Sow feed additives on the market: Are they worth it? In: Proceedings of Allen D. Leman Conference, St. Paul, MN. 20. Wray-Cahen, D. 2001. Performance enhancing substances. In: Swine Nutition, 2nd Edition. Ed. A.J. Lewis and L.L. Southern. CRC Press. pp 427-446. 21. Owen, K.Q., Nelssen, J.L., Goodband, R.D., Tokach, M.D., Friesen, K.G. 2001. Effect of dietary L-carnitine on growth performance and body composition in nursery and growing-finishing pigs. J Anim Sci. 79:1509–1515. 22. Chen, Y.J., Kim, I.H., Cho, J.H., Yoo, J.S., Wang, Q., Wang, Y., Huang, Y. 2008. Evaluation of dietary L-carnitine or garlic powder on growth performance, dry matter and nitrogen digestibilities, blood profiles and meat quality in finishing pigs. Anim Feed Sci Technol. 141:141–152. 23. Mroz, Z. 2005. Organic acids as potential alternatives to antibiotic growth promoters for pigs. Advances in Pork Prod. 16:169- 182. 24. Walsh, M. S. Radcliffe, and B. Richert. 2006. Alternatives to antibiotics – Realistic responses. Pork Academy at World Pork Expo. National Pork Board. 25. Roura, E. B. Humphrey, G. Tedo, and I. Ipharraguerre. 2008. Unfolding the codes of short-term feed appetence in farm and companion animals. A comparative oronasal nutrient sensing biology. Can. J. Anim. Sci. 88:535-558. 26. Jacela, J.Y., J. M. DeRouchey, M.D. Tokach, R.D. Goodband, J.L. Nelssen, D.G. Renter, and S.S. Dritz. 2010. Feed additives for swine: Fact sheets – flavors and mold inhibitors, mycotoxin binders, and antioxidants. J. Swine Health Prod. 18(1):27-32. 27. Mader, T.L. and M.C. Brumm. 1987. Effect of feeding sarsaponin in cattle and swine diets. J. Anim. Sci. 65:9-15. 28. Colina, J.J.; Lewis, A.J. ; Miller, P.S. ; Fischer, R.L. 2001. Dietary manipulation to reduce ammonia concentrations in nursery pig facilities. J. Anim. Sci. 79:3096-3103. 29. Cheeke, P.R. 2000. Actual and potential applications of Yucca schidigera and Quillaja saponaria saponins in human and animal nutrition. Proceedings of the American Society of Animal Sciences. J. Anim. Sci. 77:1-h-10-h.
30. Sanders, M. E. 2000. Consideration for use of probiotic bacteria to modulate health. Symposium: Probiotic bacteria: Implications for human health. J. of Nutr. 130: 384S-390S. 31. Gaskins, H. 2003. The commensal microbiota and developments of mucosal defense in the mammalian intestine. Pages 57–71 in 9th Int. Symp. Dig. Physiol. Pigs, Banff, Alberta, Canada. Univ. Alberta, Edmonton, Canada. 32. Simon, O., W. Vahjen, and L. Scharek. 2003. Micro-organisms as feed additives – probiotics. In: 9th International Symposium of Digestive Physiology in Pigs, Banff, Alberta, Canada. p 295-318. 33. Gibson, G. R., and M. B. Roberfroid. 1995. Dietary modulation of the human colonic microbiota: Introducing the concept of prebiotics. J. of Nutr. 125: 1401-1412. 34. Mitsuoka, T. 1984. Tamononmy and ecology of bifidobacteria. Bifidobacteria. Microflora 3:11. 36. Miguel, J. C., S. L. Rodriguez-Zas, and J. E. Pettigrew. 2003. Efficacy of bio-mos in the nursery pig diet: A meta-analysis of the performance response. J. Anim. Sci. 81 (Suppl. 1): 49. 37. Manley-Harris, M., and G. N. Richards. 1994. Thermolysis of sucrose for food products: a sucrose caramel designed to maximize fructose oligosaccharides for beneficial moderation of intestinal bacteria. Zuckerindustrie. 1:3. 38. Hidaka, H.T. Eida, T. Takizawa, T. Tokunaga, and Y. Tashiro. 1986. Effect of fructo-oligosaccharides on intestinal flora and human health. Bifidobacteria. Microflora 5:37-50. 39. Orban, J. I., J. A. Patterson, O. Adeola, A. I. Sutton, and G. N. Richards. 1996. Growth performance and intestinal microbial populations of growing pigs fed diets containing sucrose thermal oligosaccharide caramel. J. Anim. Sci. 74: 170-175. 40. Schumann, C. 2002. Medical, nutritional and technological properties of lactulose. An update. European Journal of Nutrition. 41 (Suppl. 1). I/17-I/25. 41. Krueger, M., W. Schroedl, K. Isik, W. Lange, and L. Hagemann. 2002. Effects of lactulose on the intestinal microflora of periparturient sows and their piglets. Eur. J. of Nutr. 41 (Suppl 1): 26-31. 42. Branner, G. R., B. M. Bohmer, W. Erhardt, J. Henke, and D. A. Roth-Maier. 2004. Investigation on the precaecal and faecal digestibility of lactulose and inulin and their influence on nutrient digestibility and microbial characteristics. Arch. of Anim. Nutr. 58: 353-366. 47. Bakker, G.C., R.A. Dekker, R. Jongbloed, A.W. Jongbloed. 1998. Non-starch polysaccharides in pig feeding. Vet. Q. 20(Suppl. 3):S59-64. 48. Partenan, K.H. 2001. Organic acids –their efficacy and modes of action in pigs. In: Gut environment of pigs. ( Piva A., K.E. Bach Knudsen, and J.E. Lindberg, Eds), University Press, Nottingham, UK. 201-218. How can the type of facility or management practice affect the results of feeding growth-promoting concentrations of antibiotics? In general, animals that have a very high health status (housed in newer, clean facilities with excellent management practices) are less likely to respond with improved growth and feed efficiency to antibiotic feeding. In less optimal conditions, growth and feed efficiency responses of 4 to 6% are typical for growth promoting concentrations of feed grade antibiotics. Can feed additives claims be too good to be true? Producers are bombarded with products and feed additives that promise improvements in growth performance, sow production, etc. and the claims may sound too good to be true. When evaluating new products, use common sense and ask to see the results of scientific testing and federal approval. Some products are promoted based solely on testimonials and lack supporting scientific data. If you have any questions concerning the use of a product, contact your local county educator, Extension specialist, veterinarian, or swine consultant for an impartial and objective evaluation.